by Andy Higgs in Chicago, Eat, Drink and Be Merry, Features, Places, USA, We likey. Skip the hotel breakfast and hold out a while until you’re really hungry (they serve breakfast/brunch all day) and hop on the L down to South Loop to The Bongo Room (or one of their two other locations). 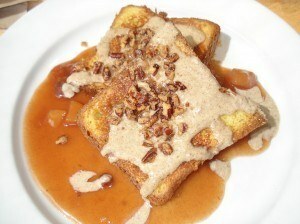 Enjoy a bottomless mug of coffee while you peruse the menu, but it’s the french toast you should be considering. Served in a variety of ways depending on the season, when I was there the menu included a brown sugar crusted brioche on top of warm spiced pear and apple compote topped with cinnamon creme anglaise, as shown in the picture. Note that the picture shows a half order. Trust me, it was amazing. Heaving at the weekends so you’ll have to be prepared to queue (especially at the original Wicker Park location) but go mid-week for a more relaxed brunch. Now here’s a tale to inspire us beer lovers. Back in 1986 a company man named John Hall read an article on microbrewed beer while waiting for a plane. Right then he decided that Chicago needed a craft brewery and he would be the one to start it. Even though he had no experience in the business whatsoever he jumped right in, and his Goose Island brewery is one of the 30 biggest in the US. In fact he just sold it to the mighty Anheuser-Busch InBev, maker of Budweiser for $38.8 million, although he sees it more as an investment in his company and will continue as CEO and the recipes will not change. This is the original bar which is today more of a gastropub but with the square serving area in the middle we’re all so familiar with from ‘Cheers’. This makes it easy to get to know the others enjoying the superb beer and great food, both produced on the premises. Goose Island beer is available in many Chicago bars but head here for the full range and the more exotic varieties. It’s an easy walk to Frank ‘N’ Dawgs if you fancy combining two places on this list. Which I did, and can recommend heartily. 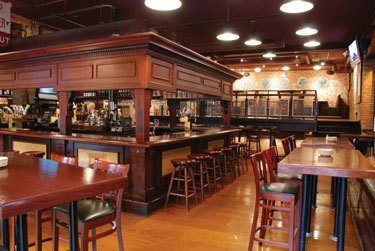 Be warned that time flies here and you can easily spend the whole afternoon at the bar. Which I also did, and can also recommend heartily. Just down the road from the Goose Island Brew Pub is no less than a gourmet hot dog restaurant. Possibly the biggest food revelation of my year to date, just a glance at the picture above makes my mouth water with the memory. Essentially a master chef decided that he wanted to change the image of the humble hot dog and opened this modest place in Chicago. 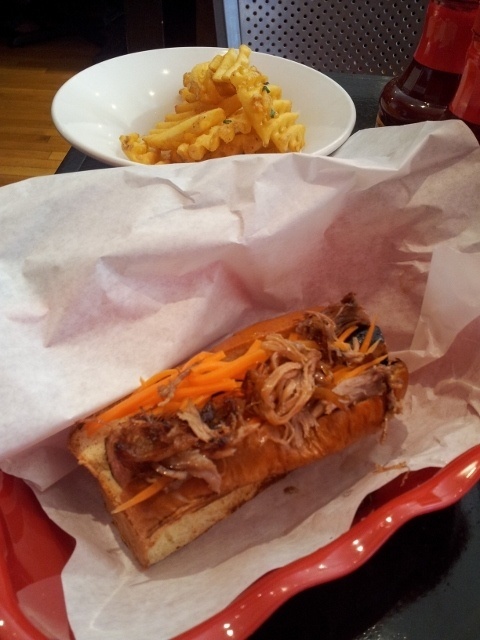 Deciding what to order from the extensive menu may take a while so ask for advice – mine was one of the most popular called the Tur-Doggin’ – turkey & date sausage, crispy duck confit, herb garlic aioli, pickled onion relish & pickled carrots. Don’t forget to order the Triple Truffle Fries; these are no ordinary chips but Yukon Gold waffle cut fries made with truffle oil, truffle butter, truffle salt & freshly chopped herbs. The bread is out of the ordinary too: the multiple award winning and lauded bun is a New England style lobster roll; baked daily by a local artisan baker, lightly buttered and toasted to perfection. After ordering you choose a mug shot from the ‘wall of shame’ (I picked Charlie Sheen) which you stick on your table so the waiter can find you. Wash it down with a root beer or other non-alcoholic beverage (there’s no licence) and you’ll never look at a grilled hot dog in a sesame seed bun in the same way. Do not come to Chicago without coming here. This gastropub surprised many by taking home a Michelin Star in 2010. From the outside (like many of the best places, it seems) it’s not much to look at but once you start reading the menu you realise that Longman & Eagle doesn’t push your usual bar snacks. 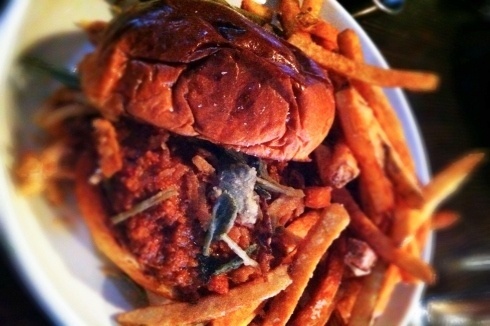 I opted for the Wild Boar Sloppy Joe with crispy sage, onion, pickled jalapeno (oh yes!) and beef fat fries and washed it down with a cold Weizenbier while sitting outside. The weather was not good but the rain held off until I’d finished – there was an hour-long wait for a table indoors. Suffice it to say that the word has been out about this establishment for a while and they don’t take reservations. so be prepared to wait. It’s worth it and you can always try one of their renowned cocktails or whiskies while propping up the bar. As the sign on the door ‘Eat, Sleep, Whisky’ suggests, you can even stay the night here if you’re lucky enough to bag a room which we heard were less than 90 bucks for the night. Longman is also famous for its breakfast and brunch menu so you could find yourself here all day if you do so. I’d probably recommend staying somewhere a little more central though and making the easy trip out here on the subway. 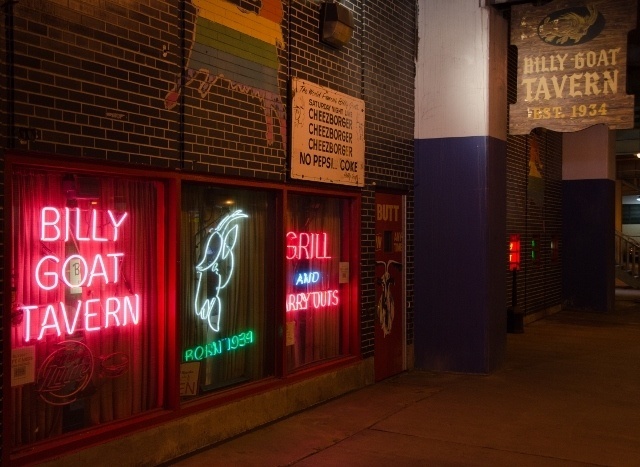 In a way the Chicago equivalent of New York’s Katz’s Delicatessen, the Billy Goat Tavern is a subterannean bar and burger joint that owes a debt to Saturday Night Live for its fame. John Belushi based his ‘Olympia Cafe’ sketches on this place and the tourists – and locals, especially reporters and cops – can’t resist checking it out. Sam Sianis, the nephew of the Greek immigrant who started the bar in 1934 still yells out orders and convinces customers to buy a double ‘cheezborger’ instead of a regular one. You don’t get (or ask for) fries or Coke here – it’s chips (potato crisps) and Pepsi only. And no cards, although they now have an ATM. They have their own beer on tap if Pepsi doesn’t float your boat. You don’t come here for a gourmet experience but the burgers are good and the atmosphere is fun. You don’t have to have over-indulged the night before to appreciate the breakfast, brunch or dinner at Flo, but if you need a pick-me up you can’t go wrong with the Original Burrito. 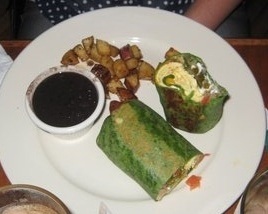 This is a spinach tortilla stuffed with scrambled eggs, roasted poblano, pickled jalapenos (oh yes again! ), pico de gallo, cheddar cheese and sour cream, served with potatoes and black beans. Add some of Flo’s own brand hot pepper sauce, order coffee and orange juice and you’ll soon be back on form. Add the kind of laid-back ambience you will probably be craving if your head hurts (a bit of peace and quiet never hurt even when you’re feeling fine either though) and great service, and you have the perfect destination for taking it easy on a Chicago morning. Or afternoon. Great suggestions! Makes me hungry. I’m headed to Chicago in August, so I’ll definitely be referencing this post! Seriously, some of the best foodie experiences I’ve had were in Chicago. I cannot wait to try those hot dogs again one day! Enjoy your trip to the Windy City!